The Instrumental Music Conservatory is a collective of musicians who play a variety of musical instruments and come from a diversity of experiences and backgrounds. This performance-based conservatory explores and studies a variety of styles of music including classical, world music, jazz and popular in both large and groups to small chamber ensembles. Students gain knowledge and skills in instrumental technique, music theory, ear training, improvisation and ensemble performance. In collaboration with the teacher, students are guided and encouraged to assist in selecting music as well as arranging and composing for the ensembles. Students playing any music instrument at all levels are welcomed and encouraged to audition. Students are highly encouraged to have, in conjunction with their Instrumental Music Conservatory commitment, a private teacher for their instrument and a full-year commitment to the Conservatory. 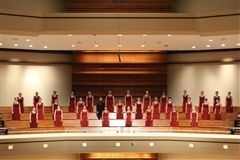 Major performances include the annual Carol Night, Mayfield Benefit and the Music in May spring concert. Numerous other performance opportunities arise during the school year, especially during the holidays. Recently, Instrumental Conservatory has performed at One Colorado, Disneyland Performing Arts OnStage, Knott’s Berry Farm Performances in the Park and more. Northern Illinois University - B.A. California Institute of the Arts - M.F.A.